Encouraging children to save is one of the greatest gifts you can give them. Start when they’re young, so it will become a lifelong habit. TFCU’s SaveAbles Kids Club, for children under 18 (geared to age 13 and younger), is designed to teach them about money and saving while they’re young. Making regular deposits into their SaveAbles savings account reinforces the saving habit. 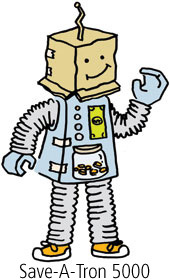 Each child takes home a little prize from Save-A-Tron 5000’s treasure chest when they make a deposit in person. They can also save at home. Make sure their piggy bank is see-through, so they can see their savings add up. Have each child save for a specific item and keep a photo or other visual reminder of what they’re saving for where they can see it. The item should be inexpensive enough that the children will not give up before reaching their goal. Make a big deal out of it when they reach the goal and don’t delay in taking the child to purchase the item. Reinforcing the reward aspect of saving goes a long way to establishing the saving habit. In addition to a prize with every deposit, SaveAbles account members receive a gift when they open their account, a birthday card to bring in to get a gift, a quarterly newsletter geared to them and an invitation to Save-A-Tron’s birthday every year.